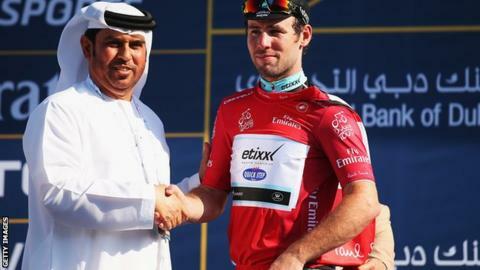 Mark Cavendish won a final-stage sprint to capture the Tour of Dubai title. The Isle of Man rider, 29, had slipped four seconds adrift of Germany's John Degenkolb on Friday. But he claimed 10 bonus seconds in his second stage victory of the four-day event to finish six seconds clear of the German in the final standings. "To win here is pretty special," said Cavendish. "We rode hard the whole week and today we really had to work. I'm super happy with our lads." The Etixx-QuickStep rider clocked a time of two hours, 37 minutes and 15 seconds in Saturday's 123-km stage, which finished at the world's tallest building, the Burj Khalifa. He finished just ahead of Team Sky's Elia Viviani and Juan Jose Lobato of Movistar, both of whom recorded the same time as Cavendish. Degenkolb could only cross the line in ninth. Cavendish was critical of rival teams at the end of the race, claiming that "most of the days we were the only team riding". "I was a bit frustrated with the other teams," he added. "They came here but didn't really want to race."